Light-o-Matic from DS Media Labs is an iPhone 4 app that makes use of your the new built in Camera LED Flash to turn your iPhone into a powerful and handy Flashlight. Light-o-Matic has 3 built in features: A Flashlight, a Strobe Light, and a Safety Mode. The graphics used in Light-o-Matic are superb and the layout is very clean, professional and promotes ease of use, which is something you really want when you’re in search of a flashlight in the dark, right? The flashlight mode has a flashlight graphic that includes an on/off switch. Tap on it to turn it on/off and your iPhone’s LED Flash responds accordingly. along with a nice little clicking noise, and the graphic of the flashlight also illuminates when turned on, both of which are great for making things easier to understand and feel closer to a real flashlight. 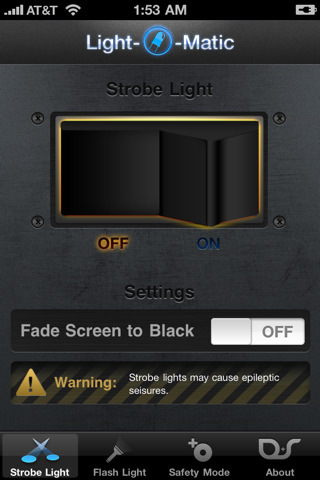 Now the second feature that app gives you is a Strobe Light. Now you might think why in the world would you want a strobe light on your iPhone? Maybe you’re at a rave or party and want to entertain, or perhaps you’re jogging and or riding a bike at night and need some safety lights. Usage here is done with a large on/off light switch and there is an option to fade the screen to black after a couple of seconds. A warning states “strobe lights may cause epileptic seizures.” No kidding, the light is quite bright, and I would definiley advise that you don’t point at at anyone’s eyes. Another feature that would be nice to have, and I’m not sure if this is even possible, is to be able to adjust the brightness of the light. If you haven’t seen the LED Flash on the iPhone 4 yet, let’s just say, it does not lack in the area of brightness. It might shorten the life of your LED flash, and please don’t point it into your eyes. Believe me, my eyes are a little blurry right now, for having just tested out this app. Overall, Light-o-Matic is a great utility with innovative features and a great price, not to mention the beautiful design. A must have for iPhone 4 owners who foresee a potential use down the line. AppSafari review of Light-O-Matic was written by Joe Seifi on July 8th, 2010 and categorized under App Store, Featured, Utilities. Page viewed 4304 times, 1 so far today. Need help on using these apps? Please read the Help Page.